I know, I know. No one wants to look at snow boots right now, but I really could not ignore this deal! 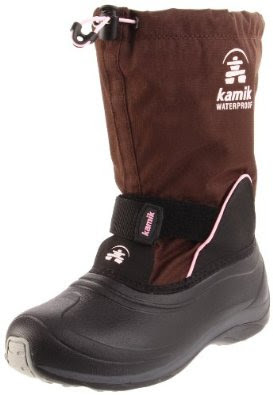 These Kamik Shadow 2 snow boots retail for $79.50, but are marked down nearly 80% right now to just $17.51 at Amazon! And they qualify for free Prime and Super Saver shipping. The color is listed as "dark pink", though certainly looks brown with pink trim in the image. Perhaps it is more of a burgundy in real life? At any rate, if you feel like taking a bit if a chance on color to get this fabulous price, these are available in sizes 8,9 toddler and big kid sizes 2-6. Quantities are very limited, so act fast if you need these for next winter. Unbelievable deal. Thank you for the heads up!! You are so welcome. Pretty crazy, right? i got a pair -- and the son has been wearing them for fun inside the house! what an amazing deal. havent seen it this dirt cheap.